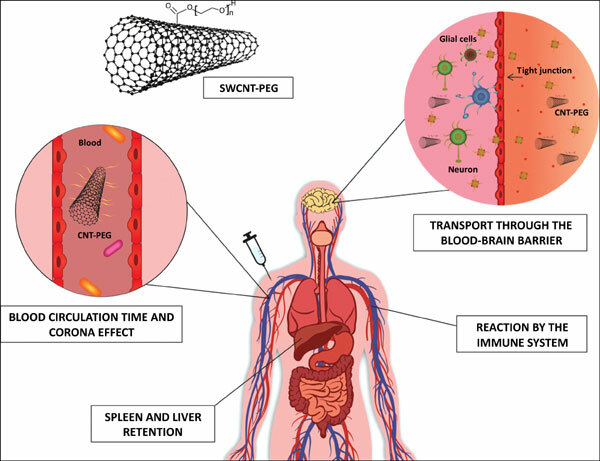 Background and Objective: In this mini-review, we have compiled the most recent and comparable information to shed light on the action of PEGylation in the biodistribution of carbon nanotubes (CNT) in the central nervous system (CNS). It is well known that due to the complexity of the CNS and the severity of the outcome following changes in this system, this is one of the areas where there are more investments in research to develop new technologies and approaches for more effective and less invasive treatments. The CNS is highly protected against toxic and invasive microorganisms thanks to the blood brain barrier (BBB), but this protection also prevents the passage of potentially beneficial molecules for the treatment of neurological disorders. Nanotechnology attempts to develop nanocompounds that are biocompatible and non-immunogenic, and that are able to cross the BBB in therapeutic amounts without causing damage and to diffuse through nerve tissue. These compounds should also be cleared and biodistributed properly, being capable of performing drug delivery exclusively for CNS pathologies, such as neurodegenerative diseases (Parkinson's and Alzheimer's) and brain tumors. Conclusion: In this way, this review focuses on CNT PEGylation, aiming to help in the development of viable and effective nanomedicines for neuroscience applications. Biodistribution, brain, carbon nanotubes, nanotechnology, neuroscience, PEGylation.